DEERFIELD, Ill. — The Chicago Bulls signed free-agent forward Mike Dunleavy to a two-year deal on Wednesday, looking to improve their outside shooting. 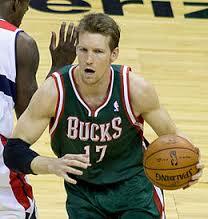 Dunleavy agreed to terms on July 1, the first day of the free-agent negotiating period. He averaged 10.5 points last season for the Milwaukee Bucks and shot 42.8 percent from 3-point range. The Bulls finished 20th in the league in 3-point percentage last season, and Dunleavy’s accuracy has improved in recent years.